“A tremendous evening! I thoroughly enjoyed it; it was worth missing Grey’s Anatomy for. Anyone I have spoken to thought the presentation was funny, entertaining and gave great parental advice. I could have listened for another two hours. 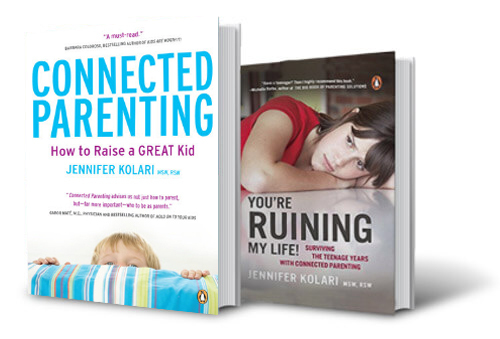 Jennifer Kolar’s skillful interventions using her highly effective technique of enhancing communication between children and their parents has been an invaluable asset for many years. Connected Parenting has filled a very important gap in traditional approaches to helping parents raise their children and has focused on new techniques that enhance the reciprocal nurturing of the child and the parents. In my 25 years of family medicine, I have encountered but a handful of superlative child therapists; Jennifer Kolari is one of these gifted people. Overall, my patients’ feedback has convinced me that the Connected Parenting approach is effective in promoting healthier family relationships. The Connected Parenting book is going to be a required reading in any subsequent courses I teach on child and adolescent psychotherapy. Our staff and parent communities truly enjoyed listening to Jennifer Kolari’s insights into communicating with children. She is a natural storyteller, who uses humour to help her audience understand that while parenting is not always an easy road, there are things we can do to help make it just a little less bumpy! Her wealth of both practical and theoretical knowledge make her a very valuable resource. We had Jennifer Kolari come to Whitestone Lake Central School to speak to parents in an evening program about “Connected Parenting”. We really did not know what to expect and had allotted two hours. Jennifer is a very engaging speaker with a very good sense of humour and a wealth of knowledge about brain development and child behaviour. Her presentation was extremely interesting and everyone would have listened for another hour! It was an extremely worthwhile evening. Many parents have since used some of the “Connected Parenting” strategies and are asking when Jennifer will be back for more! The Connected Parenting workshop was so well received by the parents at Kleinburg Public School. Jennifer was funny and engaging and the examples she used really resonated with the audience. By the end of the evening parents gathered around to speak to one another about how we were going to put the Connected Parenting principles to work in our own lives. Jennifer was very inspiring…we believe that this method of parenting will make a difference in the way we raise our children. Our camp staff immediately came up to the director/owners of the camp to thank us for having her come to speak. They said she was one of the best speakers we have ever had because the material she gave was so useful and practical. We can’t wait to have Jennifer come back next year. Trish and I are witnessing a lot of awareness in our staff about empathy first, then problem solve. It’s been a great skill to marry with our collaborative problem solving approach. Staff have come to me directly and have said: “I mirrored! and it really worked! It’s amazing how easy and affective it is.” My perspective is that it is a very important skill that is part of the whole Towhee approach, that we have never been fully successful in teaching. (Though, a lot of us already do it.) Jennifer is just incredibly talented at teaching it. Thank you Jennifer, for taking the time to share a different perspective on how we can relate to our kids. I just wanted to express my thanks for the wonderful talk you gave last night at Leo Baeck. I spend a lot of time thinking and worrying about the difficult environments that our children are growing up in today and it was so comforting to hear my concerns echoed in your words. You are so dynamic, engaging and you presented your information in a relatable, clear and “easy to action” way that I felt very empowered when I left. By the way, I’m the Mom that had the Snapchat example. Thanks again. I hope to be able to hear you speak on other topics in the future. My daughter Zara is 6 1/2 and was diagnosed with Asperger’s 3 years ago. We have been struggling with a number of issues, including sensory sensitivities, meltdowns, and powers struggles over the smallest things. Zara has done a lot of therapy, and has made huge strides, ‎but still seemed to have so much anger inside, which she would mostly direct at me. She recently started therapy at The Listening Centre, where I happened on a copy of your book. I read it twice while she was in her sessions and have been practicing the CALM and baby play techniques for just under a week. As I write this I have to stop because I keep crying. I finally feel like I have connected with Zara. We have had more peace and happiness in our house in the past few days than in the past few months.‎ Yesterday on a two-hour car ride she was on the verge of melting down over a sibling refusing to share a toy, and we even managed to calm our way out of that. That night at bedtime she said “Mummy can I talk to you?” and shared something that was bothering her at school. She hasn’t down that in the longest time. I did a lot of listening and mirroring before offering a solution and when I did she accepted it with a smile! I am a problem solver by nature, and realize that before your book I was always minimizing her discomfort or trying to “fix” things, instead of just empathizing with her and letting her come to her own realization, with some gentle guidance. The result was that she dug in her heels and we ended up fighting, screaming, and angry.‎ All she wanted was to feel heard, and I just didn’t let myself hear her.